I have oily eye lids. I use the sheer yellow all over my eye, not just under the eye to help obsorb my lid oils and as a base to keep my eyeshadow put. I also just use it every day to make my eye lids and on the corners, not just under the eyes, look less dark and more awake. If I do a full make up, then I put the brightening concealer #2 on top. It works perfectly for my oily lids and some, wrinkle skin. Great product! Good undereyes and does not crease easily. Gently conceals and brightens. I also use it as concealer on face and for subtle highlighting under or over powder foundation. I’m pretty fair and use light peach. Extra light peach was a little too light under eyes and looked ghostly on me in photos. This is my favorite powder concealer to use under my eyes and to brighten areas of my face. This is the smoothest and silkiest powder concealer I have ever used, it NEVER looks dry at all! I use light peach, it is the perfect under eye brightener and highlighter for me. This is not a great concealer for covering acne but that's not what it's intended for. I have this powder in light peach and it is amazing. I am a new, first time mama and my eyes look awful. I use the Peach HD concealer under my eyes and set it with this powder. dark circles vanizhed! My lids are also dark and i just use this powder on the lid and I no longer look like a zombie. I have very sensitive eyes and this powder does not irritate me at all. It never settles in my lines or creases when I put it on my lids. I started out with samples of the Peach HD concealer (P40) and the Sleep in a Jar (light peach) sample and these are now my "ride or die." The combo of these 2 products is amazing and I tried SO MANY concealers and powders to mask my raccoon eyes and nothing worked until SN. Thank you for these amazing formulas! Like many others, i have tried dozens of concealers, and this is by far the best. I mix the yellow and light peach together and the combination provides the perfect color for my undereyes. if my skin is slightly darker warmer months, i do a light sweep of my foundation (also from SN) over the dual concealers. Thrilled to have found this product. I have triedReview by Erin W.
I have tried a lot of different concealers from drugstore brands to high-end products and this out-performs them all. Unlike cream or liquid concealers, this doesn't settle into lines under my eyes. I have fair skin with noticeable dark circles under my eyes and this is perfect. It works for blemishes too. I didn't expect a powder concealer to work, but I was willing to try it and I'm so glad I did. This is my concealer from now on. I can't liveReview by Shannon H.
I can't live without this product! Very blendable, and finishes well, even with my dry skin. This was aReview by Anne P.
This was a bit too white for me, as the shade is close to white, in my opinion, so I will be trying the next shade up. I have veryReview by Kristan H.
I have very fair skin with really dark under eye circles and this concealer works wonders! I should have skipped on the sample size and just bought the full size container. Love this stuff!!!! One of myReview by Mariann V.
One of my favourite products here. Sleep in a jar indeed. This works. IReview by Leonie K.
This works. I have tried every concealer I could lay my hands on and this really works. This is a godsend for me. My dark blue circles under my eyes are gone! Please keep making it. This product worksReview by Natalie C.
This really makesReview by Pomeline E.
This really makes a difference if you have dark circles under your eyes. Mine aren't too dark or pronounced, but there is a weird and unattractive greyish/purplish area under my eyes, and this provides great results. It makes you look a lot more awake and 'fresh', without looking fake or chalky or obvious. The formula is divine - very silky and fine. 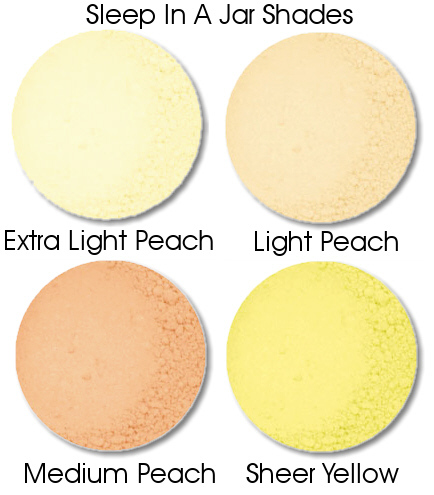 I use extra light peach in the winter and ligthtpeach in the summer - extra light peach is very very light. I think this is definitely worth a try - a sample is $1, so you have nothing to loose! I ordered aReview by Isabelle R.
I ordered a sample and thought I'd have it around for the next few months - what actually happened was that I was so in love I used this one day after the other right until it was empty after a week or two. I rarely use something up in a row like this, but I loved this effect. It is very, very light (I hate it when 95% of the drugstore concealers are too dark for me), blends well, looks natural and non-chalky and feels silky like we know it from Silk Naturals. It can cover my undereye circles almost completely so I look much more fresh, and the shade works well with my golden skintone. It's not ashy, not too pink but not yellow either so the area is lightened up without having a weird undertone, which is a major reason why I now bought the fullsize. This stuff worksReview by Shannon D.
This stuff works very well at concealing the purple circles I have. I was amazed at how much more awake I looked. I would definitely recommend a sample of this. It's the best under eye concealer I have tried, and I have tried A LOT of them!! Magical! I neverReview by Julia T.
Magical! I never really get dark circles, but the times I do, this product makes me look well rested, and bright eyed! It is no wonder this was sold out before! This works veryReview by Sonia W.
This works very well for me with minimal time and effort. It blends easily and does a pretty good job of covering my dark circles with minimal time and effort. Most under-eye concealers I've used in the past required a great deal of time and effort, so this is a welcome change! I'm sure using this and my foundation I could completely cover my circles by carefully applying it thoroughly, but I'm usually in a rush in the morning. So I just quickly tap it on and smooth it in with a brush and then apply my foundation as usual and I find that it does a much better job than just using foundation alone and it blends much better for me than yellow powder does. I have badReview by Rhys M.
I have bad undereye circles. And very visible because I'm pale. Nothing's ever knocked them completely, but SIAJ gets rid of about 75%, which is a remarkable improvement, and the best product I've used, by far. For the more 'mature' crowd: Try dotting it on with a fingertip just before your moisturiser dries to avoid accentuating fine lines. The coverage onReview by Jessie B. The coverage on this product is excellent! It covers my zits and does wonders for the blueish color under my eyes. this is itReview by Caroline S.
this is it i tell you. i've been burning the midnight oil lately and the result is dark eye circles but with this concealer, it all vanished! i look totally well-rested. awesome stuff. Great under eyes.Review by Amy M.
Great under eyes. I apply it directly to the dark curve under my eye and it blends perfectly with the lighter area directly under the eye. I'm very fair-skinnedReview by Daniel P.
I'm very fair-skinned with bad, reddish blue under eye circles and this product is a godsend! I put it on top of my foundation, using my baby buki, and it completely conceals my under eye cirkles without looking heavy or cakey. And it doesn't emphasis the lines under my eyes either! I'm delighted with this concealer, having tried tons (both mineral, liquid and cream - high end, low end and pro products) and this is the first one which really works without looking like I have tons of product underneath my eyes.